Normally, in the fall, I take every chance I can get to eat pumpkin and pumpkin spice- in my coffee, pumpkin rolls, doughnuts, etc… Mini loves pumpkin too so I figured it should have a starring role this fall in my basic playdough recipe which became our new favorite- Pumpkin Pie Playdough, and it deserves an Academy Award let me tell you! It goes well with our other Playdough Recipes. 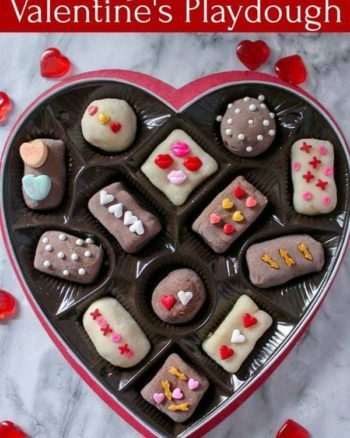 It has a nice soft texture and an amazing smell! 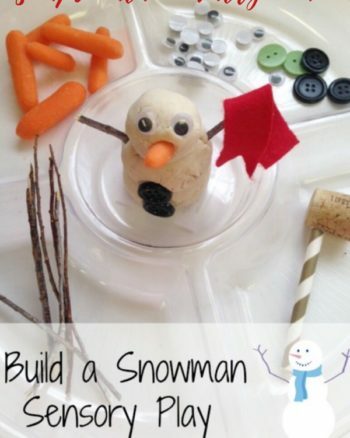 Use it just as is with a couple tools or make up an invitation to play with a few more items and a divided container for hours of sensory fun and creative play. Combine all ingredients in a large saucepan and cook over medium heat, stir frequently for about 5 minutes. 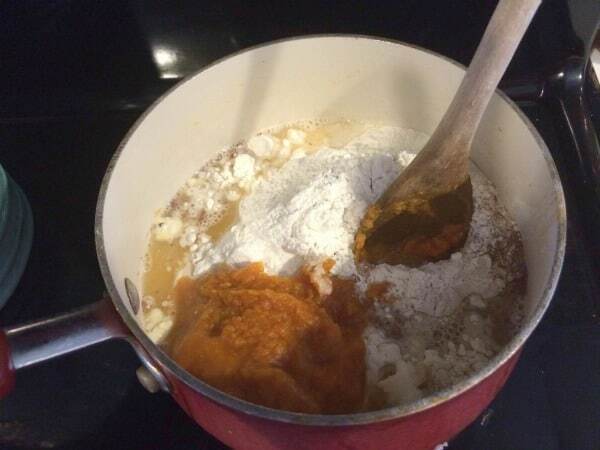 Your dough will start out very liquid-y (yes this is a technical term) but will eventually form a ball and pull away from the sides of the pan, sticking to your spoon. 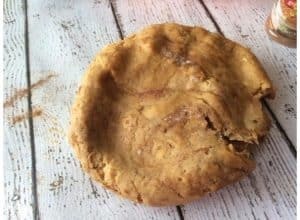 Flip dough out onto floured surface and allow it to cool enough to touch. 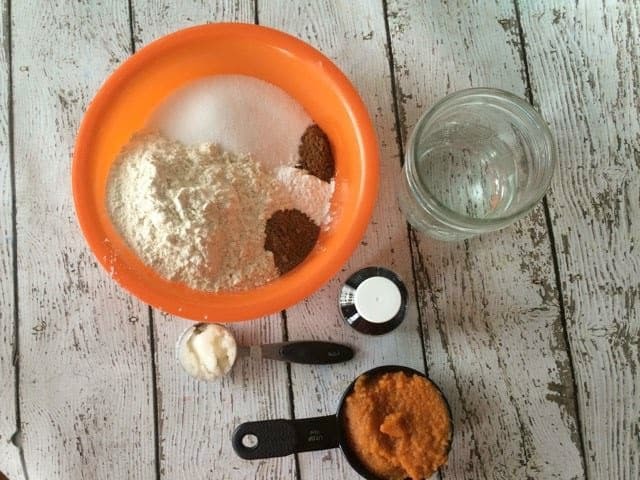 Knead the dough well to get it soft and workable, add a bit more flour or oil as needed. Transfer completely cooled playdough to an airtight container and store in refrigerator when not in use, normally I make my basic playdough and do not refrigerate it, but with the addition of pumpkin puree I believe it will mold quickly. 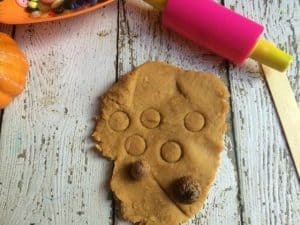 If your play dough begins to dry out just add a little oil and work it in. 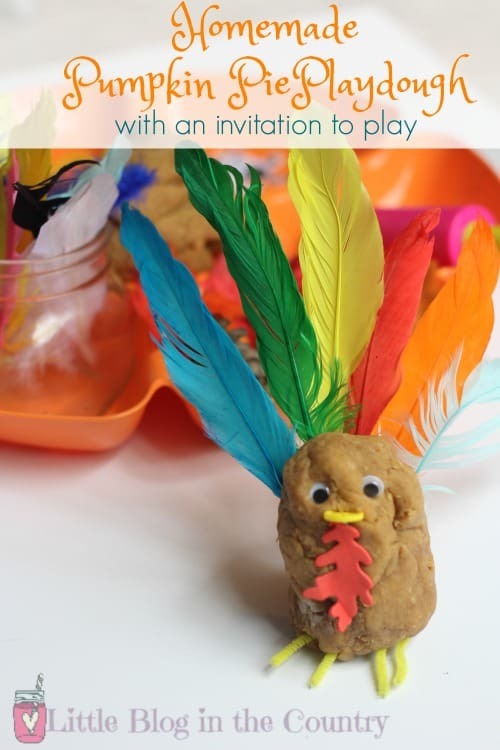 Once you have made your playdough you can turn it into a wonderful invitation to play for your child. Grab one or five of the plastic relish trays from Dollar Tree (we use them a lot). 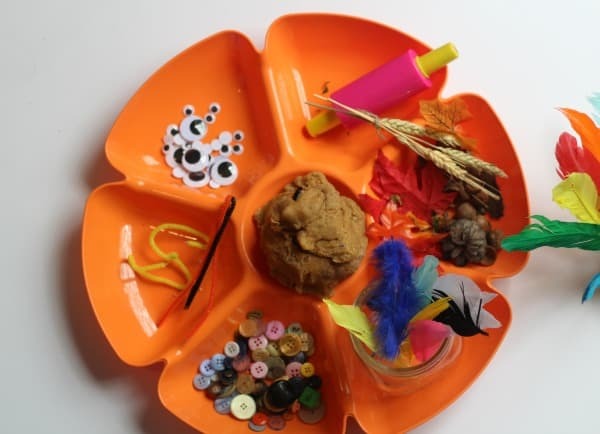 Put pumpkin pie playdough in the center of your tray, then use the other sections to add feathers, googly eyes, pipe cleaners, buttons, sticks,acorns, and playdough tools. 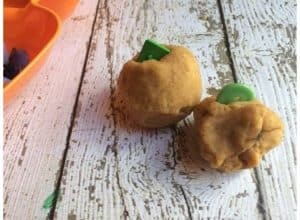 This recipe makes a generous amount of playdough-enough for 3 or 4 kids and would be a great activity for Thanksgiving to keep little hands busy. 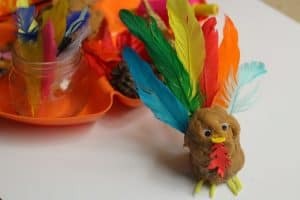 Find more fun fall sensory play in these posts below!